Tours are scheduled Monday through Friday, 10 a.m. to 2 p.m., from spring to fall and are based on availability of a guide. Tours are not available during holidays. 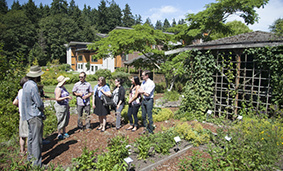 The Bastyr University Gardens consist of several gardens, all for the purpose of teaching and educating from Chinese herbs to Pacific Northwest natives. A brief overview of each one is below. The medicinal garden supports the education of students studying botanical medicine through each herb’s lifecycle as well as its role in a client’s treatment. Many botanical medicine students are able to utilize the garden to gain experience in cultivation of these plants. The nutritional gardens support the culinary and whole food classes through herbs and vegetables produced in the garden. Several nutrition students assist in the germination to harvesting cycle as well as growing a portion for local food banks. The Sacred Seeds Ethnobotanical trail is part of an international project that aims to help communities stay connected to native plants. This project is supported by an hourlong trail strolling through types of Pacific Northwest meadows and forest natives. The Botanical Sanctuary Garden is part of the United Plant Savers organization and is located in shade house in the main garden grounds. This is a program supporting the knowledge and conservation of endangered plants from the United States. The Student Village gardens are based on an edible and medicinal permaculture design. This was in conjunction with the building of the student housing built in 2009. When strolling through this area one can see signs indicating plants that may be medicinal or edible. Students are encouraged to participate in maintenance and consumption of many of these plants. A garden of a different nature is the reflexology path. The first public reflexology path in North America, the 65-foot path features smooth native Northwest river rock artistically embedded in cement with the purpose of providing foot reflexology and health improvement as one walks on the path. When scheduling a guided tour, please indicate your interest in specific areas. The Gardens are always available for a self-guided tour. There are over 250 western and Chinese herbs in the herbal gardens, several types of vegetables in the nutrition garden and approximately 60 varieties of native plants along the Sacred Seed trail. Feel free to visit, browse and explore on your own any time. (Please note: Some medicinal plants can be toxic, so we ask that you not touch or taste anything in the garden. Please respect all the garden specimens, and keep children and pets from touching, tasting or disturbing the plants). Explore the gardens with a guide that can focus on a specific area or on all the gardens. The usual length is one-hour. Walking the entire Sacred Seed Ethnobotanical trail can take just over an hour. Tours are scheduled Monday through Friday, 10 a.m. to 2 p.m., during regular business operations, from spring to fall and are based on availability of a guide. Tours should be scheduled at least one month in advance. Minimum number of guided tour guests is 10, maximum is 25. Visitor parking is available by visitor's permit; carpooling is advised. Buses and large vans require special parking arrangements. Please call Security & Transportation at 206.850.1351 or 425.602.3064. Include the details of the trip; arrival and departure times and the size or the length of the vehicle. 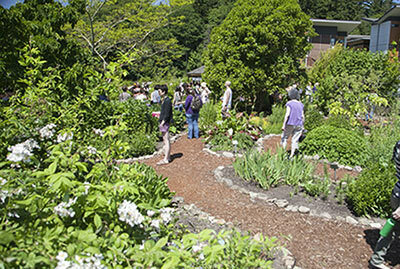 The Bastyr University Gardens operate with the help of donations. The suggested rate is $10 per person. Get directions to our campus.